Diving is not permitted at this cluster known as Blue Springs, but a mask and snorkel are all that is required for a good look at the fish and swaying plant life that inhabit the 20-foot deep pool. Snorkelers and swimmers can enjoy the 20-foot deep spring basin, which is fed by two springs: Big Fanning and Little Fanning. The springs are very popular with families who come to swim, snorkel or tube, as well as with serious divers who choose to venture into the extensive underwater cave system. The white sandy bottom is about 18 feet below a limestone shelf. Though diving is not permitted, make a big splash and cool off in the year round 72-degree water. Enjoy snorkeling the crystal clear underwater environment. See more at www.hartprings.com. These springs are one of Gilchrist County’s most beautiful hidden treasures. Although it is privately owned and accessible only by boat, it is very much worth a visit. The springs are located on the Suwannee River, just upstream of the CR 340 boat launch. To enjoy the swimming and snorkeling of this area, anchor boats in the shallows and stay in the water (the shoreline is private). 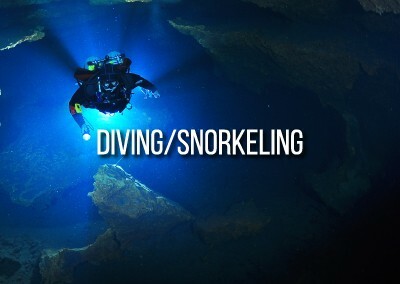 Diving is not yet available, contact the park for updates. Snorkeling and swimming are readily available in the springs where you can check out the underwater environment and take a peak down into the “crack” of the springs. Also available year round, Otter Springs has a heated pool.